This program helps you to manage your customer information, prints cheque and envelope to your customers, broadcasts email to your customers. If you need to print a lot of cheques and envelopes, or need to send a lot of emails to your customers, you must try this software. 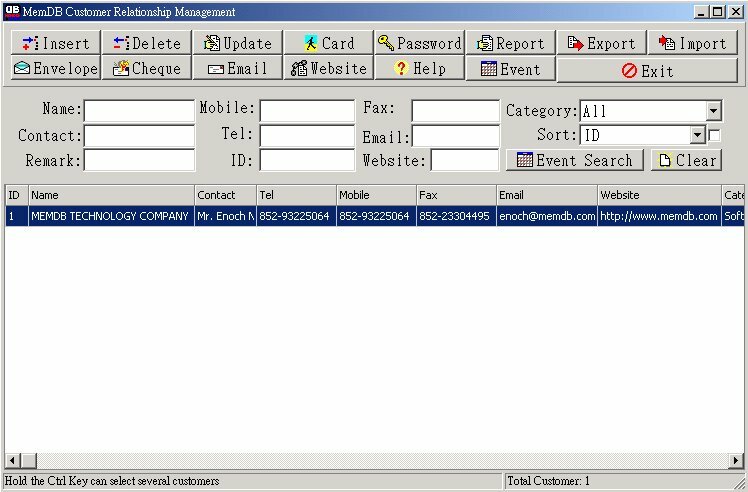 This software stores your client information to a database. You can insert, delete, update and search the customer records efficiently. You can customize and save the cheque and envelope setting for your printer. You can locate the customer, print cheque and envelope easily using your printer. You can also use this software to broadcast email to your clients. You can manage your customers easily with this software. This software is very easy to use. You can download the software, use Winzip to uncompress the file, and execute the program 'MemCRM.exe' directly. You can specify the paper size of Cheque and Envelope, configure the Top and Left position of any text string in the Cheque and Envelope, then press [Refresh] button to preview the printout. You can try to use A4 paper to test the printout and then print real Cheque and Envelope. If all settings are done, you can save the setting for future use. A online manual is included in the software, you can read it for details. You can try this software for 30 days. However, a 'Trial version, visit http://memdb.com to register' string will be shown in some functions. After you have purchased the software, all these limitation will be removed. The price of this software is HK$1000 (or US$140).